Surgery to remove fibroids is one of the treatment methods for those struggling with fibroids. There are many different types of procedures that can be performed to remove these tumors but it is always important to remember that surgery should always be the last resort because there are far too many women opting for surgery when other treatment methods including uterine fibroid natural treatment methods may be quite effective for treating uterine fibroids. As mentioned previously, if you are thinking of surgery to remove fibroids, there are many surgical procedures and many more are being discovered every day that may be recommended, but in general, the following are the most common procedures that are performed. After the caesarean section, the hysterectomy is the most common surgical procedure performed in women each year and having fibroid tumors is one of the common reasons for this procedure. The hysterectomy is performed to remove the uterus and other female organs may or may not be removed with this procedure. When you have a total hysterectomy your uterus and ovaries will be removed but your ovaries and fallopian tubes will remain. The reason that the hysterectomy is probably the most effective surgery to remove fibroids is that once your uterus is removed, there will be no place for uterine fibroids to grow. After a hysterectomy, these uterine fibroid tumors will not return. However, without a uterus, there is no chance of future pregnancy and in addition to the cost, it can lead to many devastating side effects for the woman including triggering early menopause in some women. For much more information about the hysterectomy including the other types besides the total hysterectomy that can be performed and why you should think twice before having one, click here. If you are not ready to have a hysterectomy performed maybe because you still want to have children, a myomectomy may be recommended for you. Unlike the hysterectomy, the myomectomy only seeks to remove the uterine fibroid tumors while leaving the uterus intact. Unfortunately, while there is no chance of uterine fibroids returning after a hysterectomy, this is not the case with a myomectomy. Because you still have a uterus, fibroid tumors may return. Also, sometimes the myomectomy is performed to remove only the large fibroid tumors while leaving smaller ones behind. These smaller ones can grow larger as time goes on and require surgeries of their own. For more information on the various types of myomectomies including the type of myomectomy you should opt for if you are planning on having a child or children in the future, click here. This is the most common type of image guided therapy that uses probes and pictures in order to shrink fibroids or cause them to disintegrate without actually removing them. This is also known as uterine fibroids embolization (UFE). It is not as invasive as the previous surgical procedures. 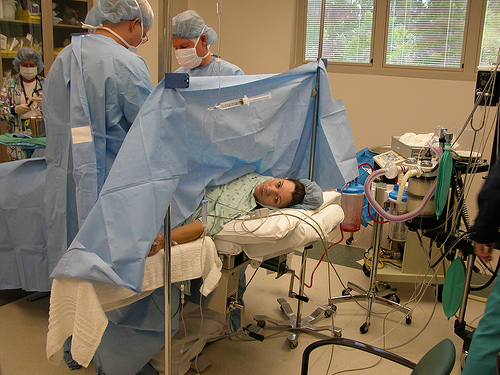 With this procedure, x-rays are used to obtain an image of the fibroids and then a probe is inserted into the thigh to get at the main blood supply of the fibroids in order to cut off or reduce the blood supply to the uterine fibroid tumors by depositing small round particles (microspheres) into the uterine artery. Uterine fibroids are thought to thrive when they have a robust blood supply. Therefore, by reducing or cutting off this blood supply to the fibroids, the tumors will usually shrink or die. For more information on UAE, click here. Severe uterine fibroid symptoms such as heavy bleeding which is not alleviated by using other methods. Unfortunately, many women are encouraged to have surgery when it is not necessary and when other methods can work better and without the side effects of surgery. Some doctors don’t even mention alternative treatments as they push women ignorant of other methods to opt for life changing procedures such as the hysterectomy. This is not to say that a woman in her right mind with all information will not choose surgery to remove fibroids including having a hysterectomy because there are many who do so. This is just to say that surgery is not the only option to get rid of fibroids. Various methods including various natural remedies may work and thus eliminate the need for surgery. One such treatment method that may work better for you and make surgery to remove fibroids unnecessary is the Fibroid Miracle holistic guide. This guide will show you not only how to get eliminate fibroid but also how to prevent them from returning using natural methods only. Click here for more on this bestselling holistic guide. Prev Herbs For Fibroids – Black Cohosh To The Rescue?